I always have multiple books going at the same time (it's one of my biggest tips for how to fit in a lot of reading). At the very least, I have one book I'm listening to, one book I'm reading, and one book I'm reading to my kids. Usually this works out just fine because the books are different enough that I have no problem keeping them straight in my head. But occasionally, the themes of two books will be so unexpectedly similar, it turns into one jumbled, confused mess. This happened with Heart of a Samurai and By the Great Horn Spoon. On the surface, they look nothing the same. And actually, at their heart they look nothing the same either. But somehow, at just the right point in the story, they are almost identical. Each book has a part in it where the main character takes a ship down the east coast of South America, around the tip of it, and back up the west coast to California. Both characters are hoping to strike it rich in a gold mine. In By the Great Horn Spoon, it's kind of the point of the book. But in Heart of a Samurai, it's more just like a little diversion (the book spans eleven years, and this adventure takes up just one of those years). However, as I was reading that part, I kept thinking, Didn't I already read this?, only to remind myself that the same things had happened in the other book. What's more, I was also reading The Voyage of the Dawn Treader around this same time, and even though there is no California Gold Rush in it, it still takes place on a ship and uses a bunch of nautical terms. Stories that happen on a boat are not my favorite to begin with, but multiply it by three, and I was feeling a little sea sick by the end. But ship lingo aside, I really enjoyed both of these books. Heart of a Samurai by Margi Preus begins with a storm. Manjiro leaves his widowed mother and siblings without telling them where he is going. He isn't planning to be gone long. He's just on a fishing boat, hoping to earn a little money for his family. But the storm doesn't care about his plans, nor about the fact that if the boat goes outside the designated perimeter set by Japanese officials, they won't be allowed back in the country. The storm pushes the little boat farther and farther out to sea. The crew runs out of food and water and almost a will to live when they spy land. It's an uninhabited island, but it does have a lot of birds on it, which make excellent meals, and it's a place for them to repair their boat before they try again. As it turns out, being shipwrecked is only the beginning of Manjiro's story. In fact, as I mentioned above, the book shows events over the course of eleven years. When the book begins, Manjiro is 14, fairly old for a middle grade novel, but by the end, he is 25, and that just seems positively ancient for the targeted audience, but somehow, it works. The majority of the book is spent on the water, and the acts of navigating and rowing and fishing don't necessarily come with an age attached to them. Manjiro, of course, grows and matures, but it happens in a way that even fifth or sixth graders can relate to. Because of the kindness of the captain of the ship who rescues the stranded sailors, Manjiro ends up in America. (I should probably mention, this book is actually based on real events and Manjiro, or John Mung as he came to be known in America, is believed to be the first Japanese person to come here.) He encounters the prejudices that come with being in the minority, but the story also looks at the misconceptions that pop up regardless of your race. There's one character in the story, Tom, who is a classic bully. He's mean and rude and always looking for a fight. He and Manjiro challenge each other to a horse race. Tom is a natural horseman, and Manjiro finds it "odd that Tom was so gentle with his horse . . . yet could be so mean to people." But then, after the race, Manjiro finds Tom in a ditch, his face bruised and bloodied by his own father, and Manjiro makes this observation, "It seems we didn't really know Tom at all." I've read one other book by Margi Preus, West of the Moon, and I remember really loving her writing in that one. That's not to say I didn't love it here as well, but I didn't feel like the styles were exactly the same. There were glimpses of the writing I loved in West of the Moon, like this one: "Sea and sky were velvety, the night embroidered with a million glittering stars, every wave frosted with silver moonlight." But overall, it felt less poetic and more orderly. Throughout the story, there is this underlying theme of what true greatness looks like. Manjiro dreams of becoming a samurai, an impossible wish in his country where aspirations are limited by birth. And yet, that doesn't mean he can't take on the traits and qualities and talents of a samurai. With everything he does, he keeps that standard in mind. And so it is that by the end, when he is summoned to go before the daimyo and a messenger says, "Well, since he has neither the family nor the upbringing of a samurai, I hope he has the heart of one! He is going to need it," he totally does. By the Great Horn Spoon by Sid Fleischman is very different (except, of course, for the uncanny similarity I mentioned above), but oh, it is so much fun. My kids loved it, and it was the perfect sort of high adventure story that seems made for summer. The two main characters are Jack (an orphan with two younger sisters who lives with his Aunt Arabella) and Praiseworthy (the aforementioned characters' butler). It's an unlikely pairing, but you see, Aunt Arabella is in financial straits and is going to have to sell her house, and the only thing Jack can think of is to leave Boston, sail around the continent, and strike it rich in California. Of course, Praiseworthy, being an excellent butler, can't let Jack go alone (the very idea! ), so he accompanies him. Everything would have been just fine (as fine as a year-long adventure without your guardian's permission can be) except that the money that was going to pay for their passages is stolen out from under them on the docks. So they do the next logical thing and stow away in a couple of barrels of potatoes until they are well out to sea without any option of turning back. The rest of the book is just as full of adventure as the opening chapter. There are thieves and bandits (referred to as "road agents" in the story), fist fights and guns, bears and burros, ship races and storms, imposters and friends, and lots and lots of gold. At one point in the story, when Jack and Praiseworthy are still at sea and hoping their ship, the Lady Wilma, makes it to San Francisco before their rival, the Sea Raven, it says: "It seemed to Jack the most exciting moment of his life." And that's how my boys treated the whole book, like it was one exciting moment after another. Every chapter brought something totally unexpected and thrilling. I have to say, my favorite part of the story was seeing how Praiseworthy gradually shed the pieces of his profession (the bowler hat, the umbrella, etc.) and acquired a red miner's shirt, a four-shooter, and whiskers. But even as his appearance changed and he began to look more like a Californian, he was still as unflustered and proper and polite as he was at the beginning. He always thought with his head first before he reacted physically (except when a road agent tried to take away his picture of Aunt Arabella--then all trace of niceness vanished). He was just such a great character. I also really liked that this book was completely different from anything else we've ever read: part-historical fiction, part-tall tale adventure, there were just so many new things to talk about. And I won't spoil anything, but I'll just say that the ending totally kept pace with the rest of the book, which is the mark of a great story, in my opinion. This is one that will stay on our favorites list for a long time. Have you read either of these books? I'd love to hear your thoughts! And also, what have you been reading lately? 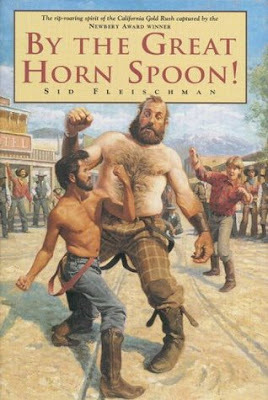 I have never read By the Great Horn Spoon but I do so love Sid Fleischman so clearly I must put it on my list! 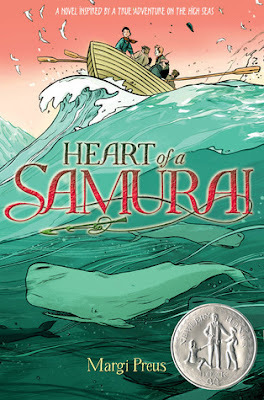 I'm putting Heart of a Samurai on my TBR. I've always loved books like that and the fact that it's a Newberry is just gravy. Thanks for sharing! One of our favourite movies is 'Bullwhip Griffin' and I'm thinking they may have taken inspiration from 'By the Great Horn Spoon' as there are lots of similarities. Main characters are Jack, his sister Arabella and their butler Griffin. Jack sets off to the Gold fields to seek his fortune to rescue the family finances, Griffin accompanies him unasked and Arabella follows. Considering your children have read the book and there are lots of differences too they may well be too annoyed to watch the movie, but we do love it, an old one. Yes, you're right! I've never seen the movie, but I watched a little clip from it after we finished By the Great Horn Spoon, and it's definitely based on the book.